Helps reduce inflammation, irritation and cartilage wear around and under patella. Recommended By Doctors & Physical Therapists. Brings the power back to your game! 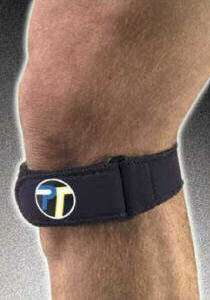 General Application: Great for alleviating moderate knee pain, especially in areas under and surrounding the knee cap. Medical Applications: Knee Pro-Tec, "The Original Neoprene Knee Strap" helps alleviate symptoms of tendonitis, chondromalacia, Iliotibial Band Syndrome, Osgood-Schlatter's Disease, and other knee ailments.